Mix thoroughly banana, flaxseed, almond/soy milk, coconut oil, date/maple syrup and vanilla extract. One by one stir in the rest of the ingredients till smooth. Spoon the dough into a greased (with coconut oil) baking pan and spread evenly. 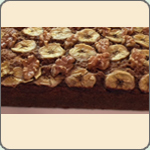 Press down banana slices and walnuts on top. Bake uncovered for about 50 minutes. Cool. Slide knife around the sides of the pan and remove.